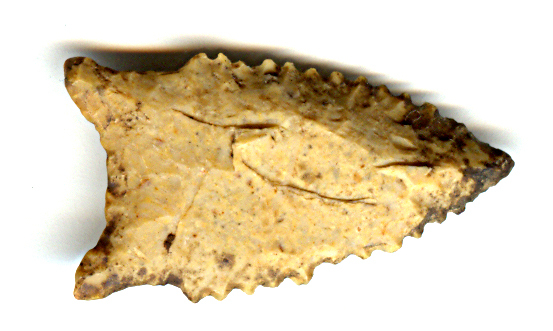 A Small Size, Visibly Anciently Aged, Nicely Serrated,Well Made Hinds Point That Exhibits Surface Aging Oxidation & Stone Coloration Patination, Correct Basal Thinning And Overall Shape, Correct Rolled Basal Stem Edge Hafting Dulling, Correct Blade Use Sharpening Reduction, Heavy Aged Surface Deposits, Correct Type Material & Manufacture For The Area Found. Found By Curtis Johnson. This Is A Nice Serrated Example Being Related To The Coldwater, Pelican And San Patrice Points. Includes A Ken Partain Certificate Of Authenticity!